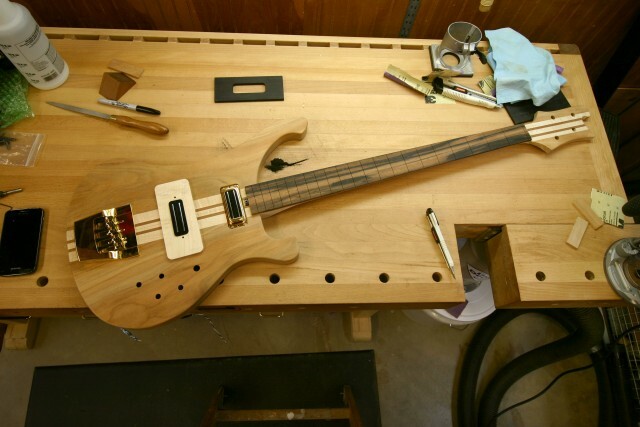 The challenge was to make an electric bass that was light in weight and heavy on beautiful woods. I took a Rick bass and created a working blueprint in AutoCad. 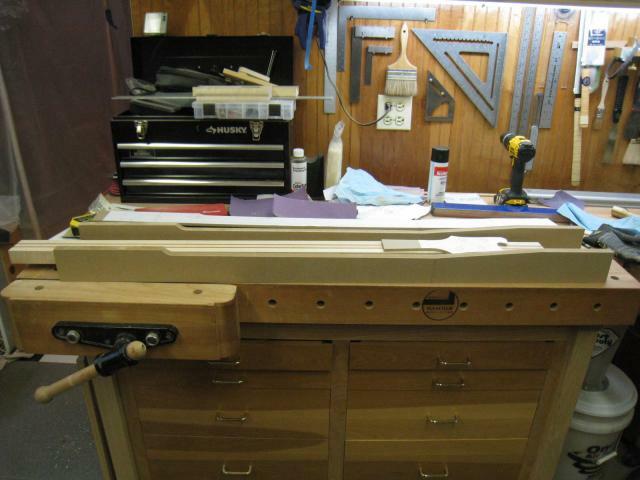 The drawing was printed out to scale and 1/4" MDF templates were made from that. This is what I will work from here. The wood choices are 8/4 Hawaiian Koa (top), 4/4 Curly Maple (2nd from top), 1/4 Macassar Ebony (on the Bird's Eye Maple) and another piece of 4/4 Bird's Eye Maple (bottom). 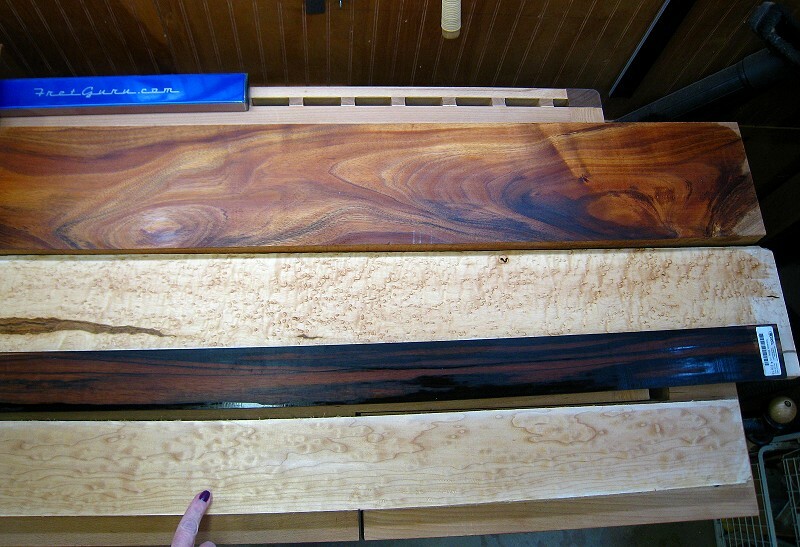 The Koa, as you can see, has some pretty wild grain but that's what makes it so beautiful, and so hard to work! 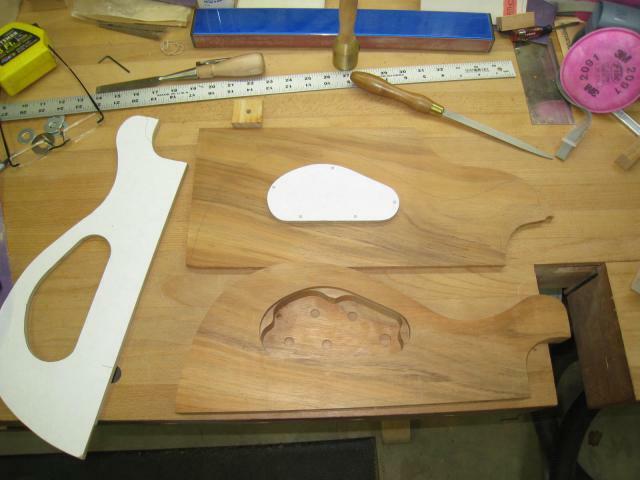 Koa will be used for the two body sides. 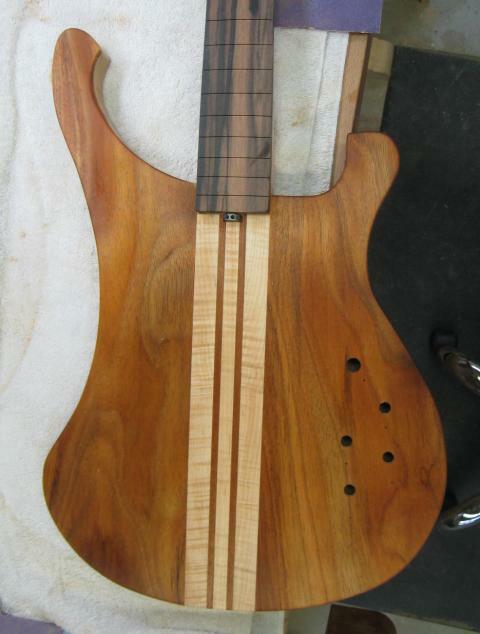 The decision was to get away from the Bird's Eye Maple and go with Curly Maple and Hawaiian Koa to make a laminated thru-neck. 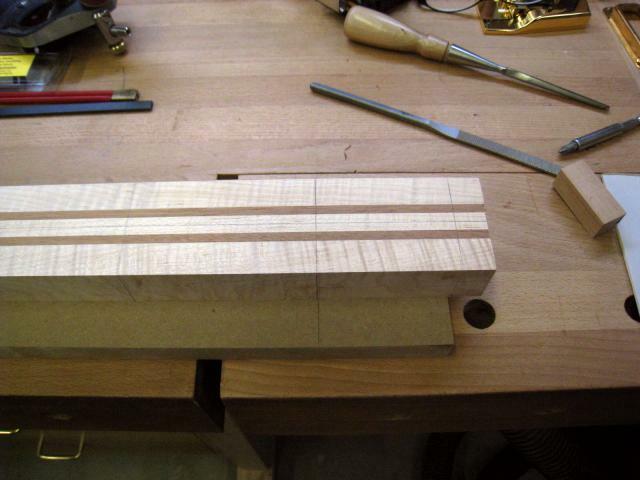 First thing was to flatten and put a straight edge on the Curly Maple. 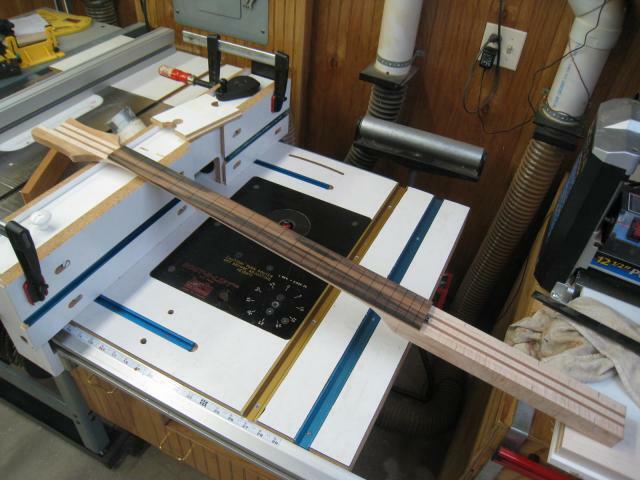 Three lengths of Curly Maple and two lengths of Hawaiian Koa make up the thru-neck laminate. 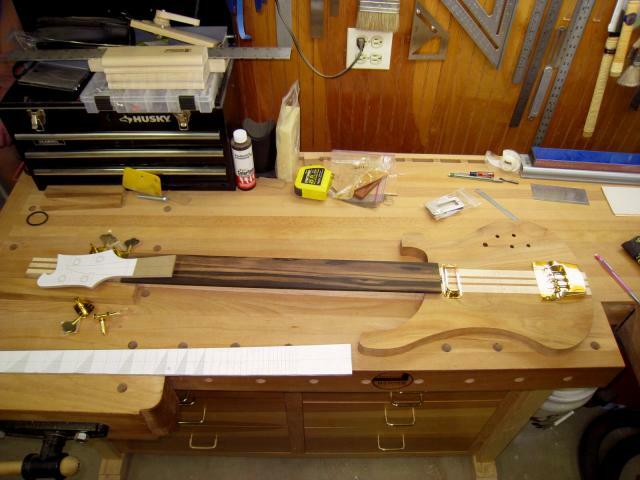 Another look at what to takes to glue the laminated thru-neck. 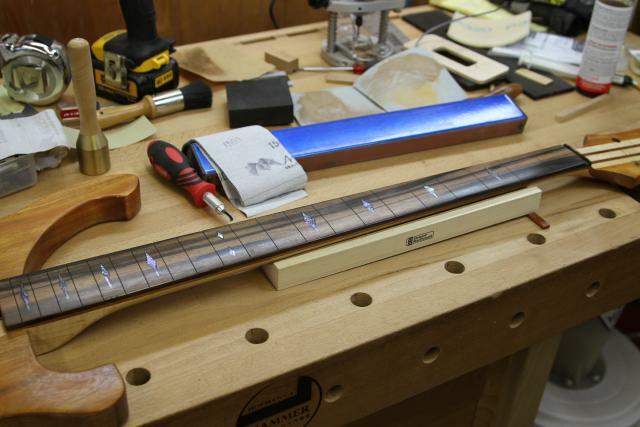 To create a more stable neck, carbon fiber stiffners are added to the Hot Rod dual truss rod for adjustments. 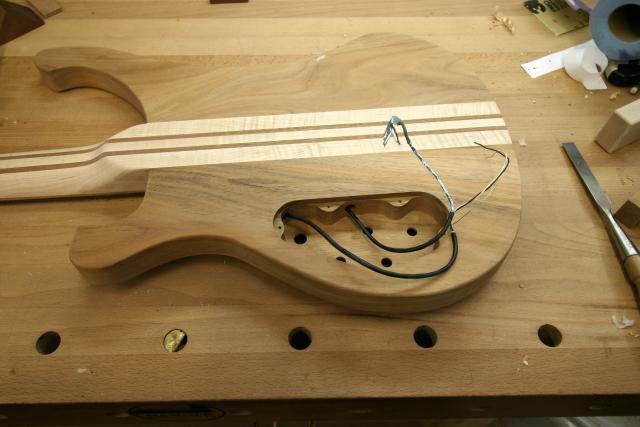 Before the parts are glued up, I drilled wiring chases from each pickup location to the the area where the controls will be. 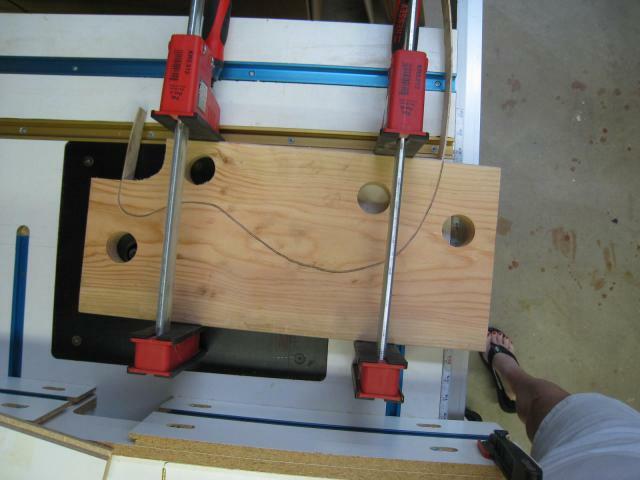 This shows the angles the holes were drilled at. 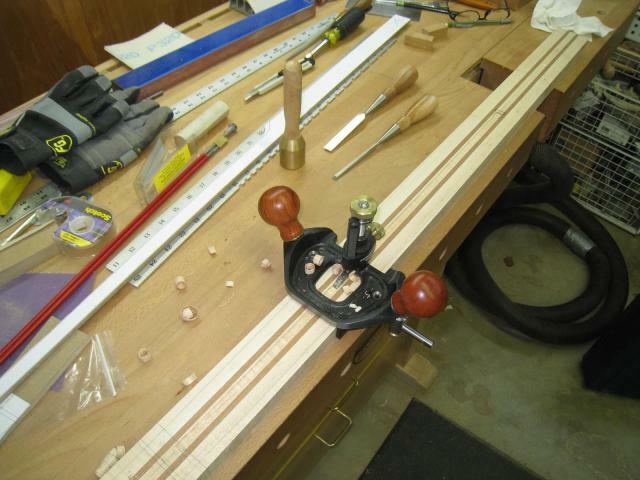 Shaping the neck includes making jigs for the router to slide along. This one is for the back side of the neck. 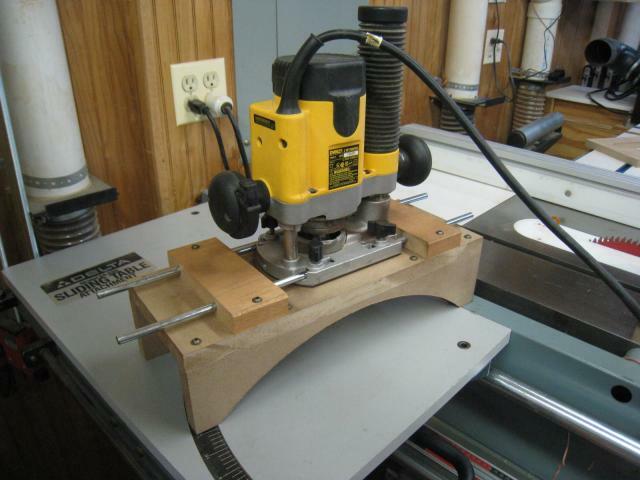 This jig will be used to create a 4 degree offset in the headstock. 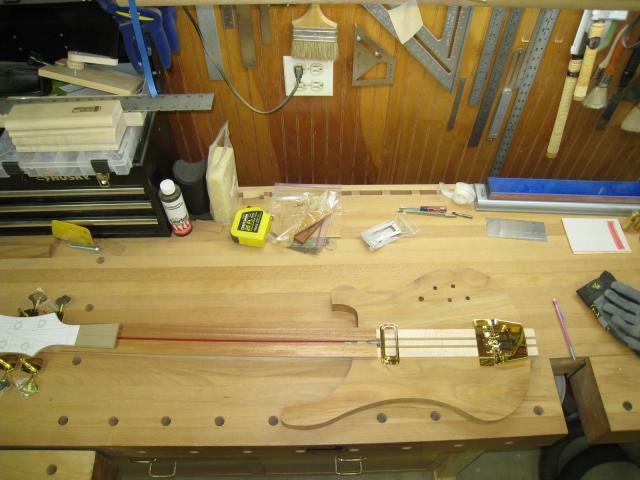 The bottom half of the body holds the volume and tone controls and the selector switch. Access to these will be from the rear of the bass. 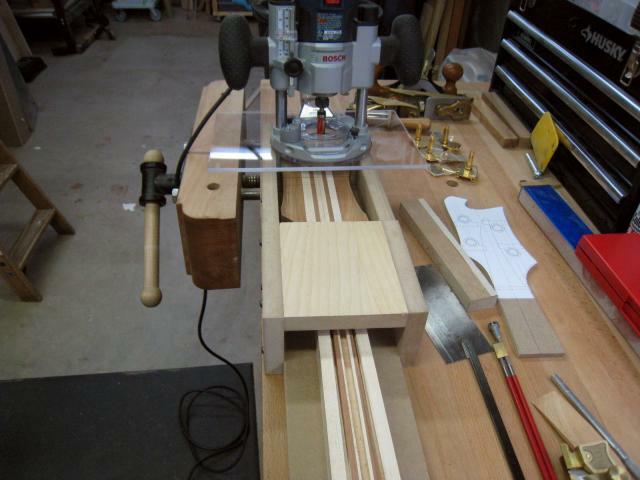 The first step is to drill out most of the cavity. Before moving along, the controls must fit. 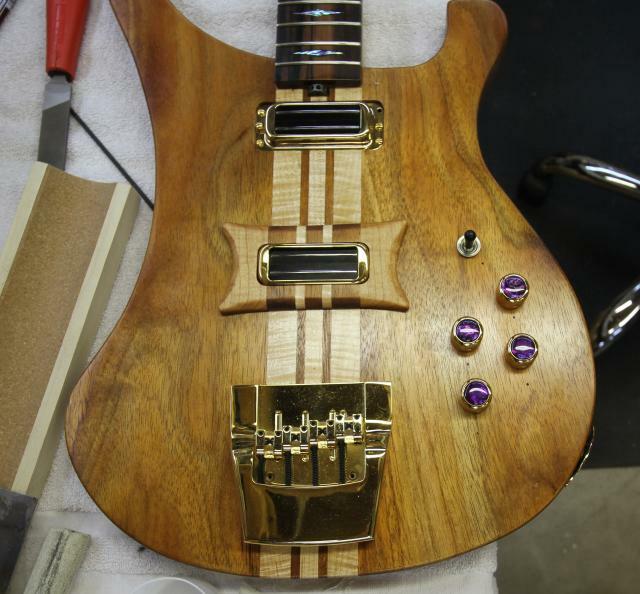 The front of the bass with the volume and tone control knobs and switch in place. 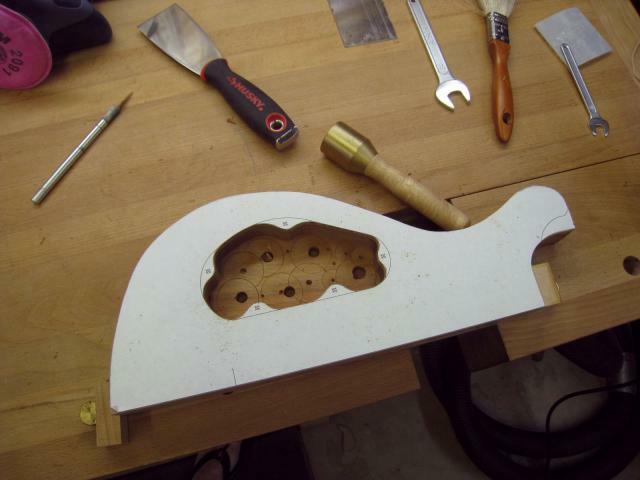 The holes drilled earlier appeared when the control cavity was routed out. 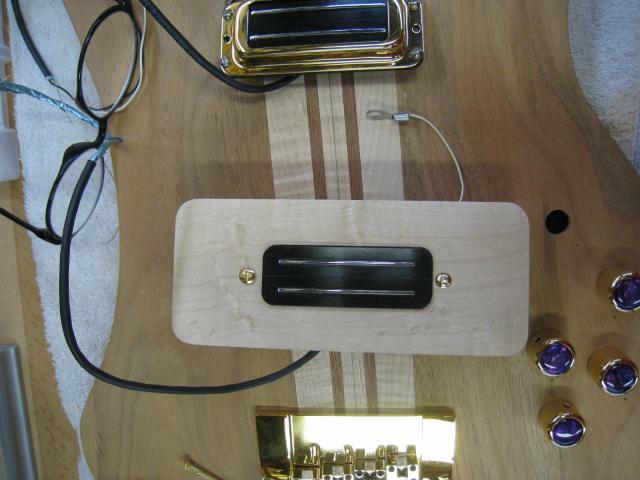 These will channel the wiring from the pickups. 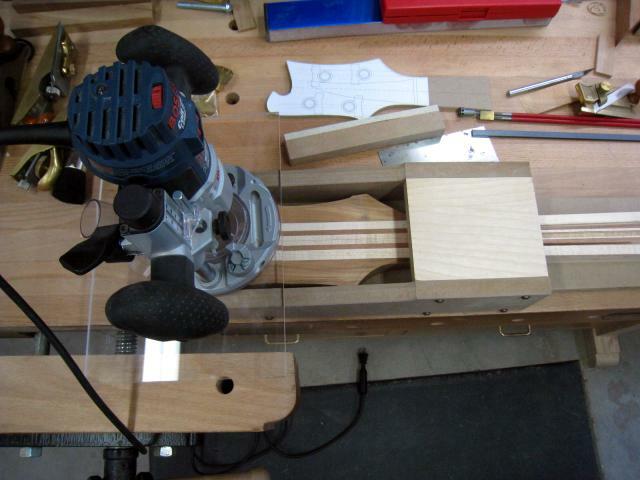 Next is creating a pocket for the cover and fine tuning the cover template. Hold down screw holes drilled and brass screws in place. 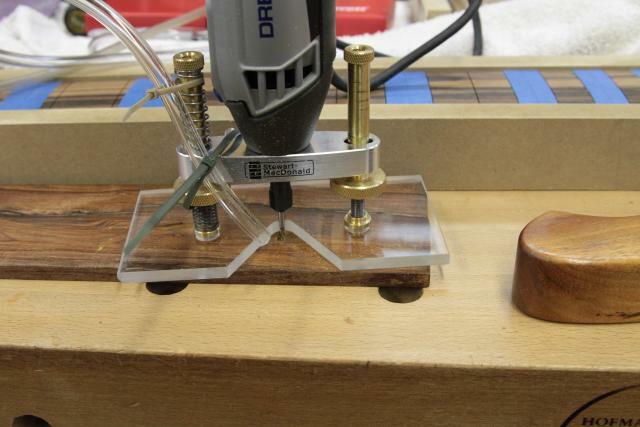 A little mineral spirits mimics what it will look like with lacquer on it. 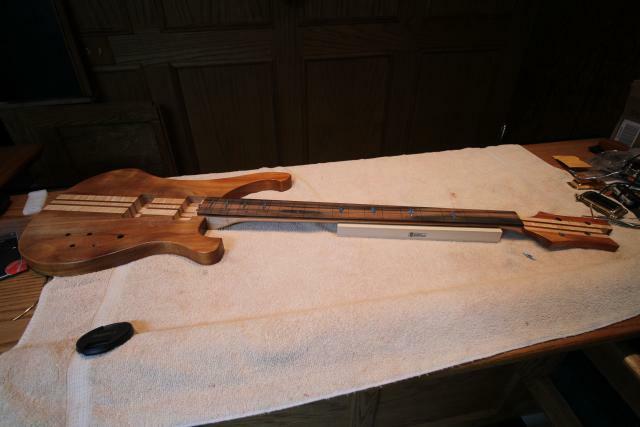 Since this was a unique build, I found it better to rout the truss rod with hand tools. The nice thing is no noise, no dust spewed into the air and more control. 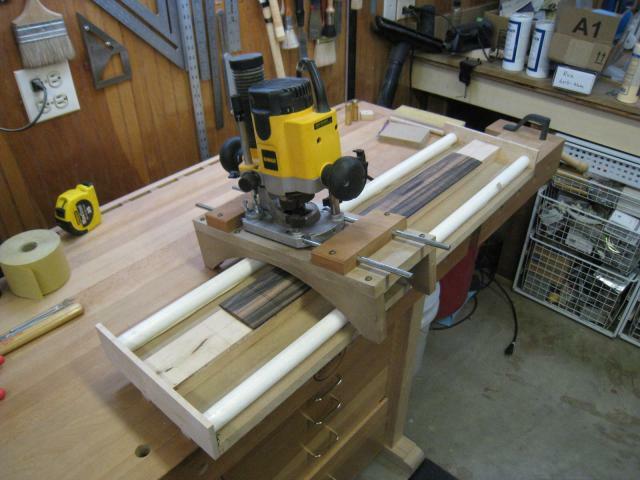 Taking the chisel to the tail end. 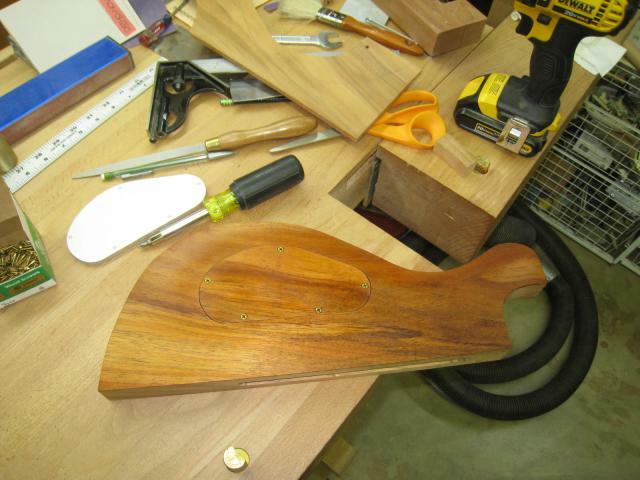 The spoke wheel will sit here. 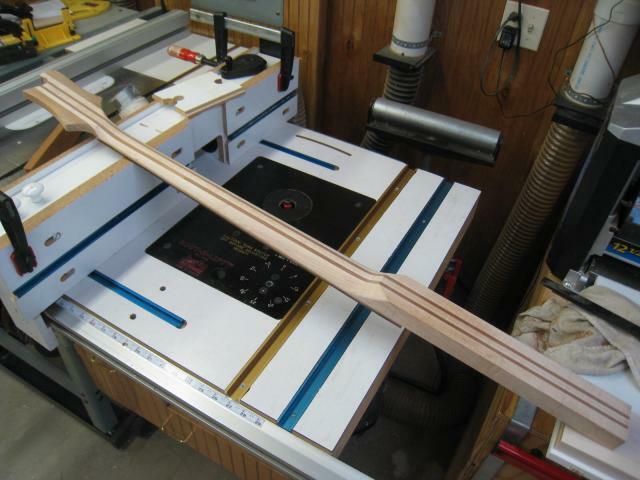 I had to leave 1/8" of the truss rod proud of the face of the neck blank to accomodate for the 1/8" filler that will be glued in later. 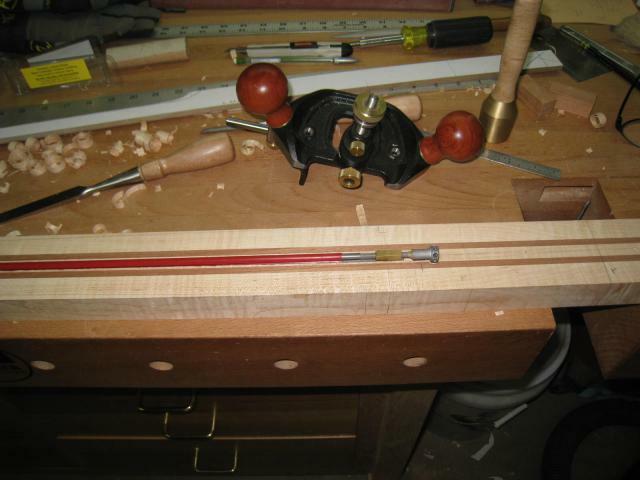 A close-up of the spoke wheel truss rod in place. 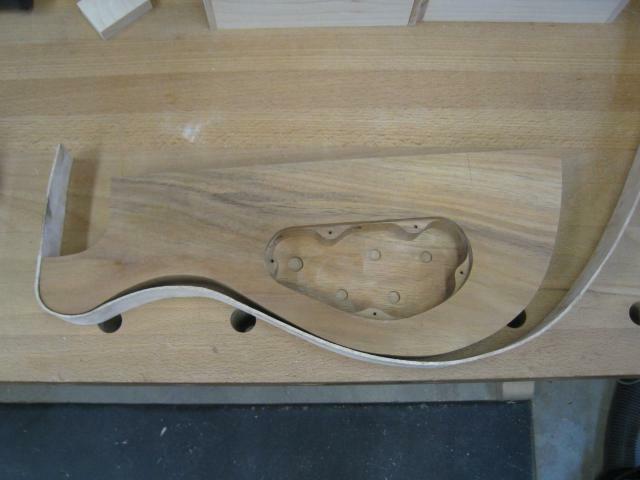 The templates formed earlier are attached to the neck blank, after cutting off the excess, to ready for the semi-final neck shaping. 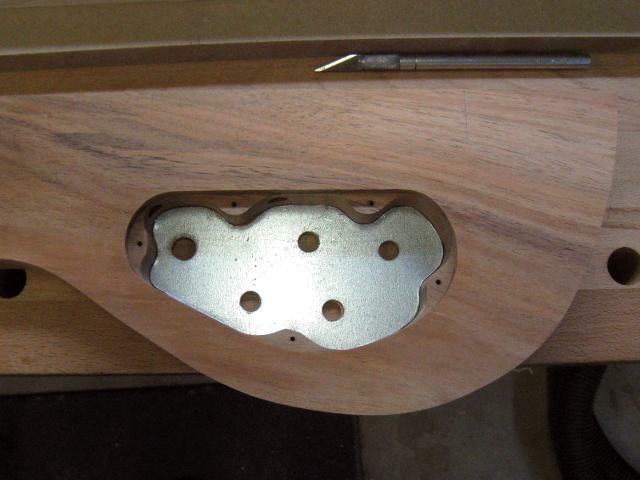 The spacer in place will have to be planed down to 1/8"
Two pieces of Koa have been cut to size for the "wings" on the headstock. 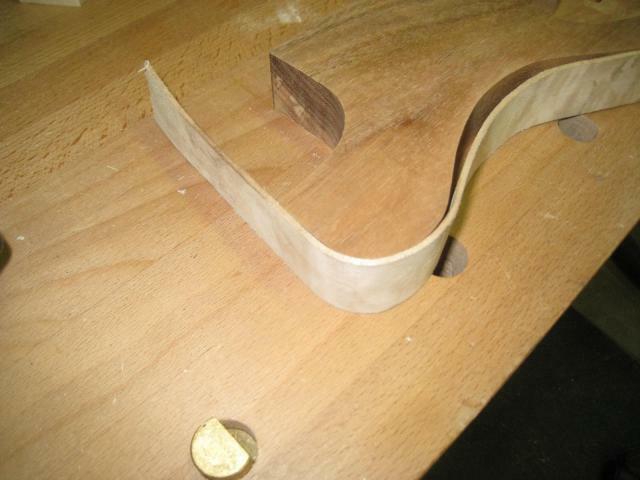 The two sides of the neck where the wings are received had to be planed perfectly flat to insure no gaps in the glue joint. Angled view of glued-on wings. 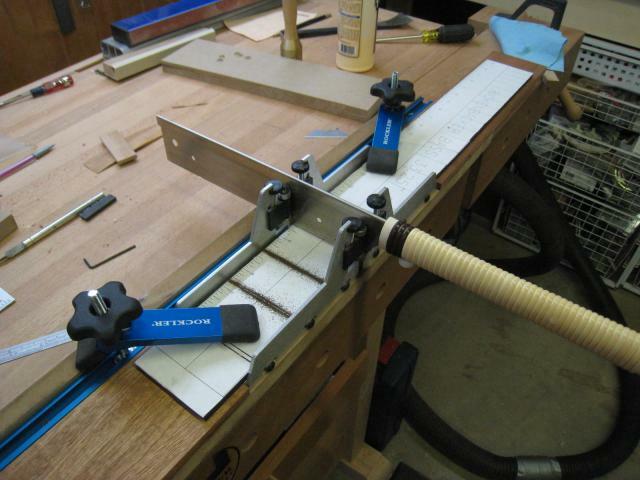 Hand routing for the two carbon fiber rods. 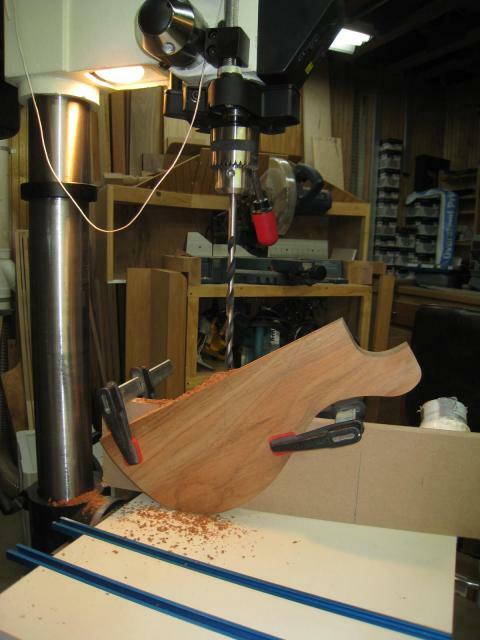 They will provide additional stability for the neck. After about 8 passes, the back is roughed out. 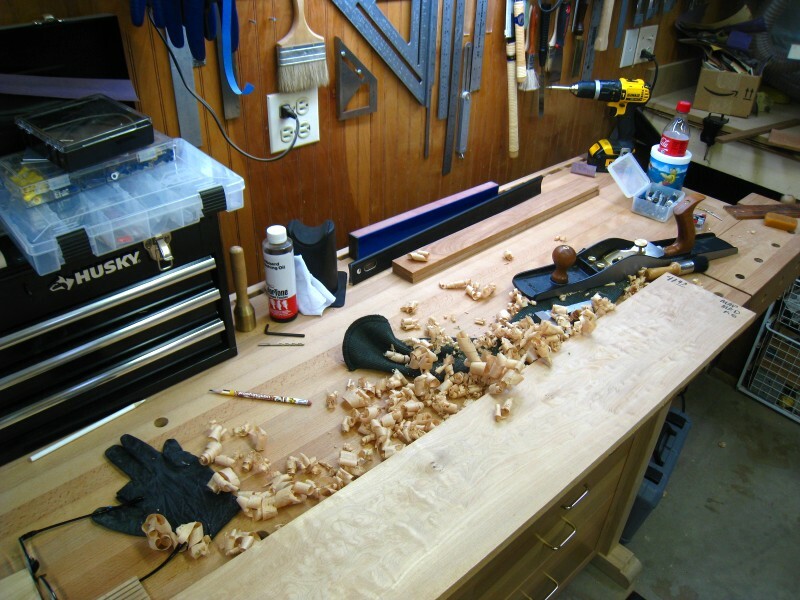 There is still be hand work to be done. 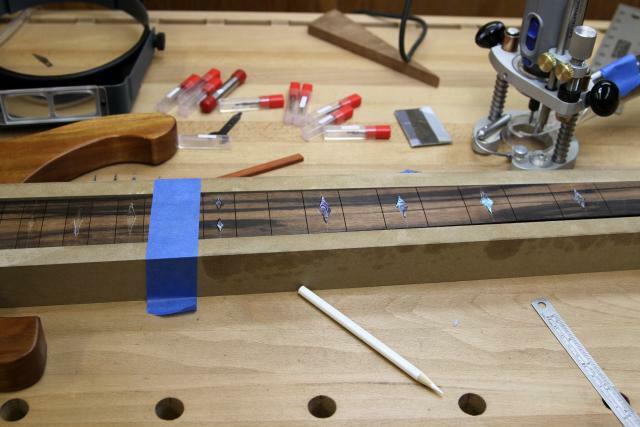 The fretboard is slotted by hand. 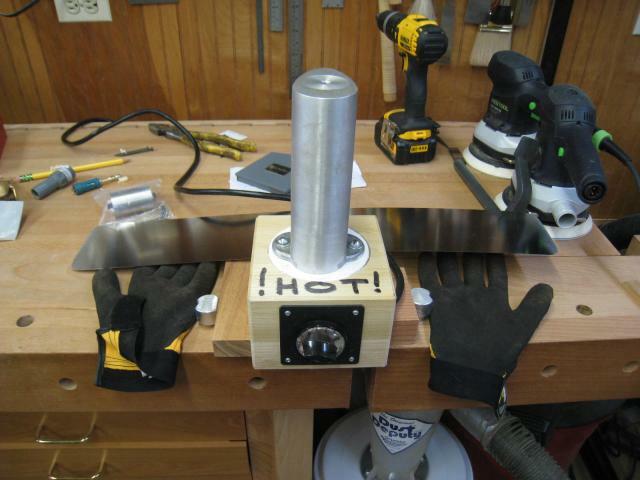 The scale is 33-1/4" and there are no steel templates made for this scale. I drew up a scale in CADD, printed it, and adhered it to the ebony stock. 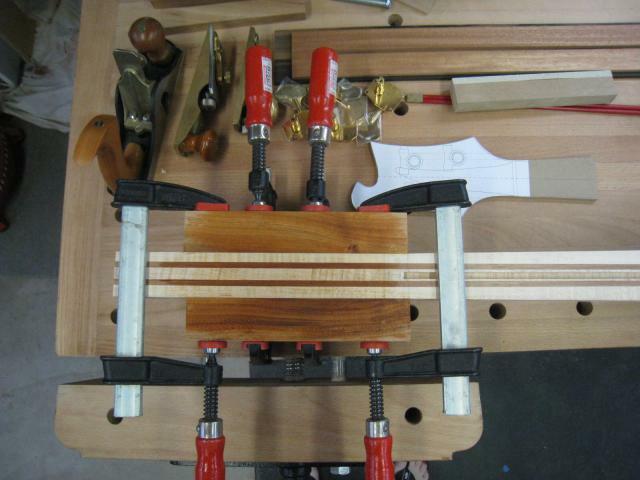 Twenty-one (21) fret slots will be cut. Once all the slots are cut, it's time to remove the paper template. 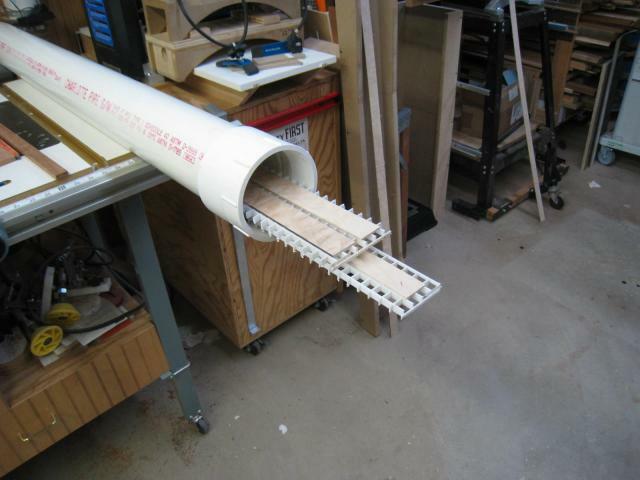 The fretboard radius will be 10" so I needed to make a router jig. 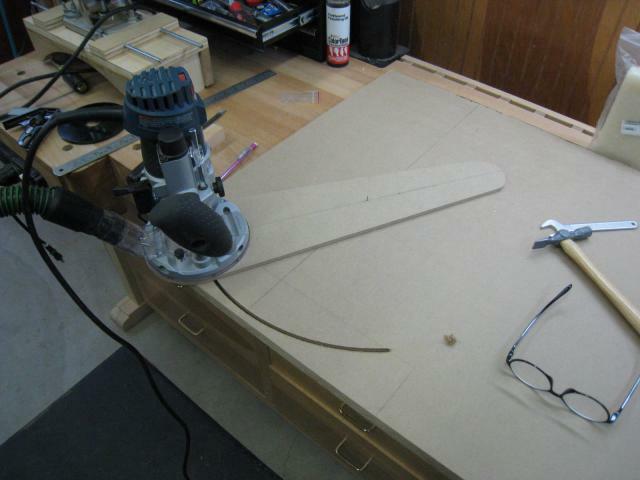 First step is using a circle jig to make the 10" radius in 3/4" MDF. 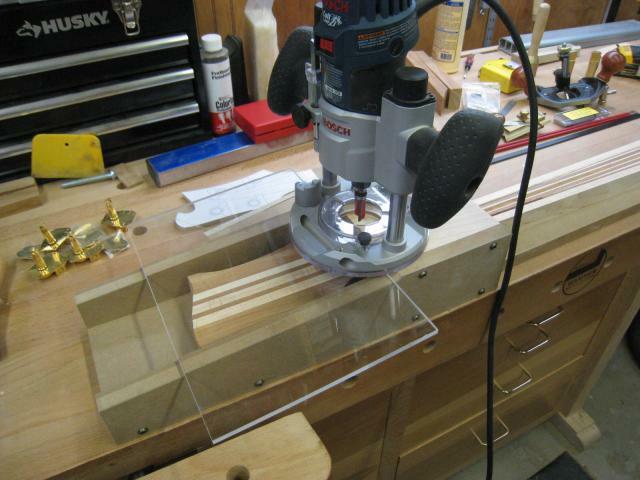 With both sides shaped, I made the top and drilled a hole for the router bit to fit through. 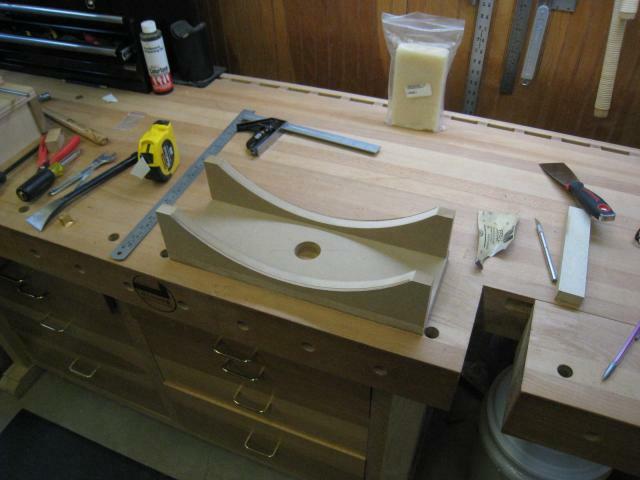 The 10" radius jig completed. View from the bottom. The black on the curved sections is ebony dust. 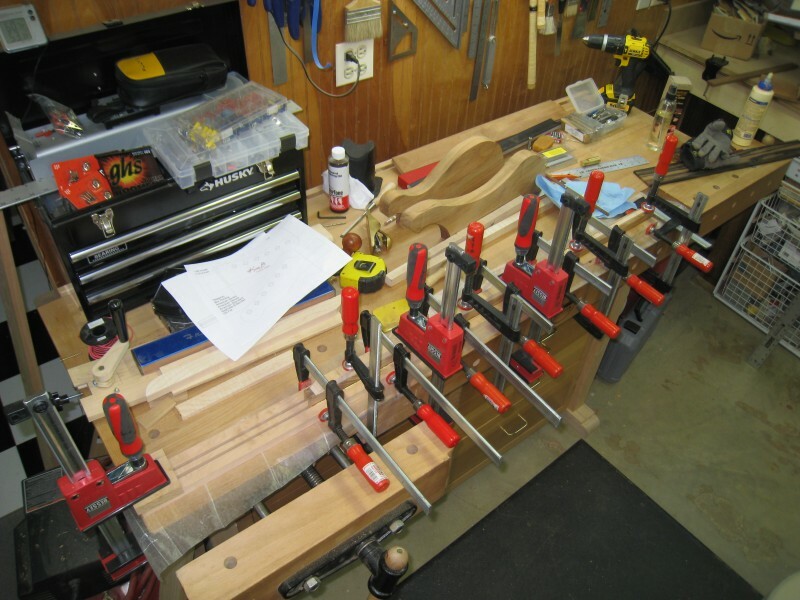 Another shot of the jig at the end of the base. 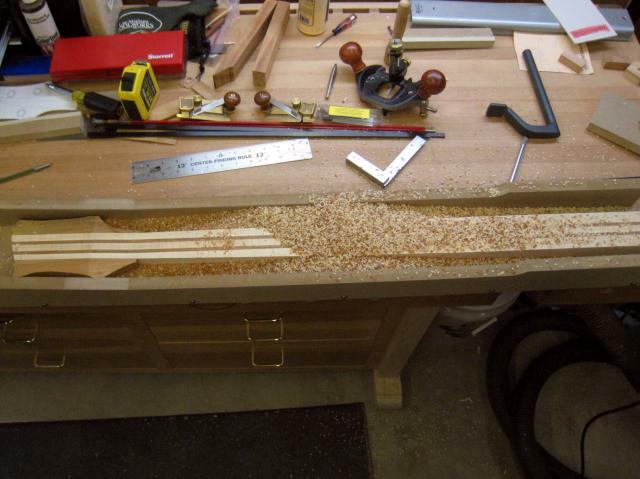 After the radius jig has done its thing, the fretboard is sanded smooth with a 10" radius sanding block. 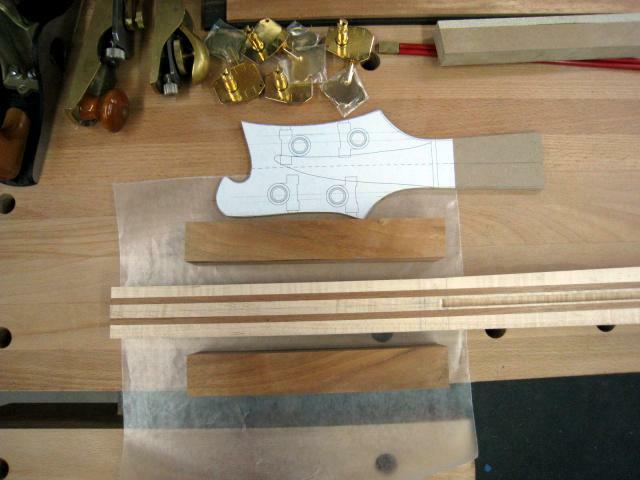 With the fretboard glued on and the headstock final shaped, the profiling of the neck begins. 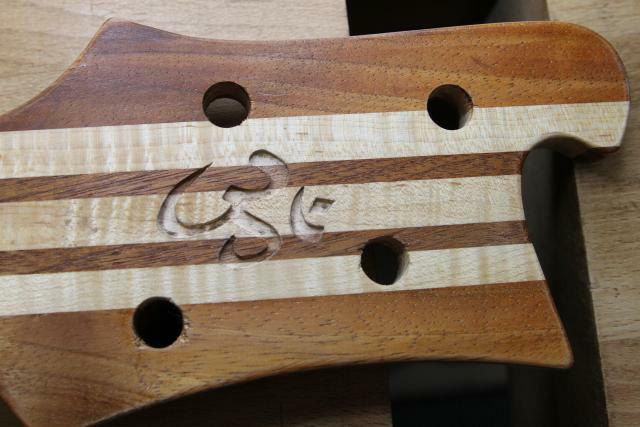 A closeup of the headstock. It's angled back 4 degrees. The tip of the head is flush with the back of the neck. 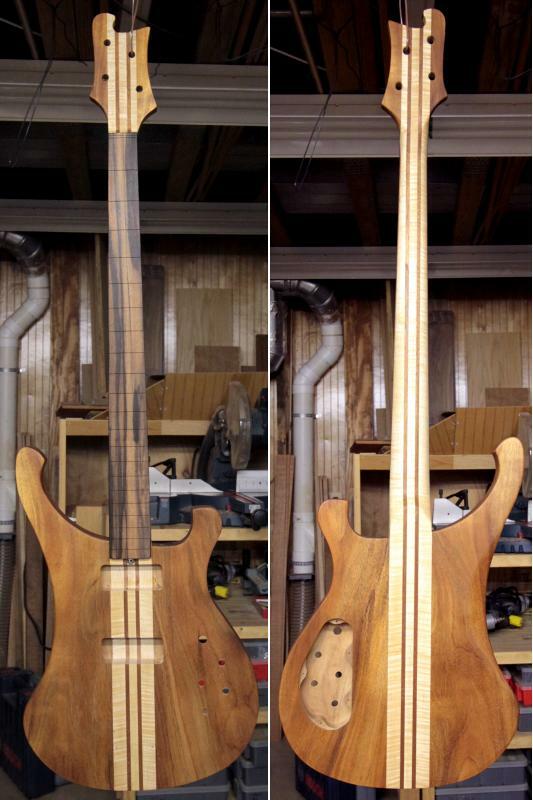 Neck shaping close to completion. 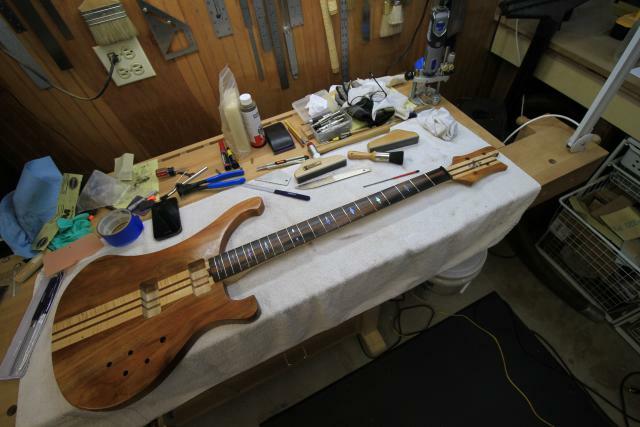 With the neck shaping completed, the test fitting is done. 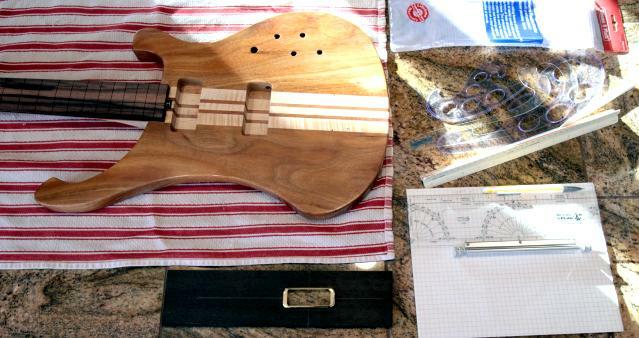 This is a first attempt at steam bending full depth binding for the body. 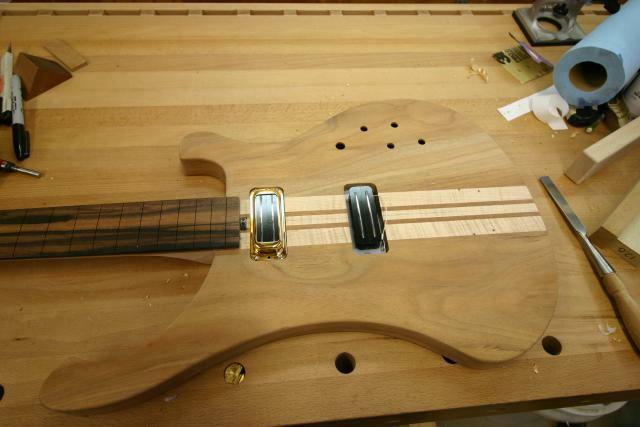 Quilted maple will be used to wrap the outer perimeter of the entire body. 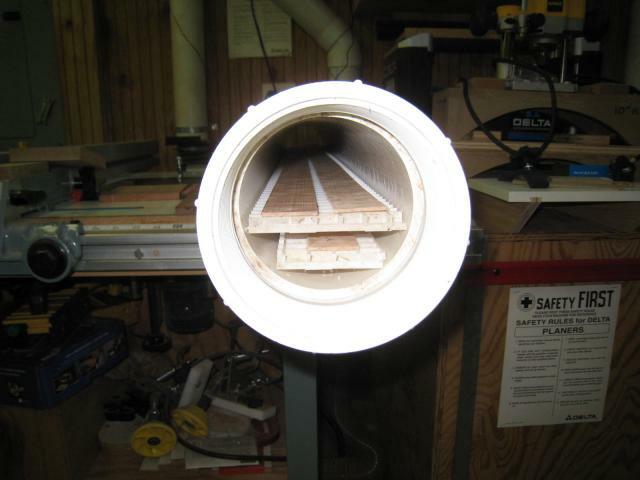 A look down the tube with 1/8" x 1-1/2" strips of quilted maple resting on eggcrate. 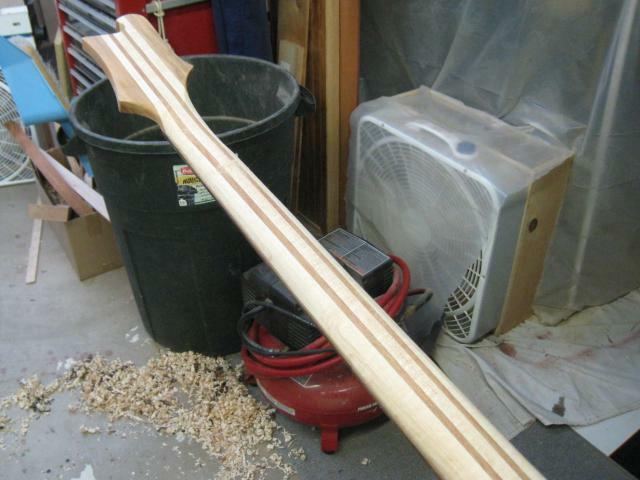 A 2x10 was planed flat and then cut to the shape of the two body halves. 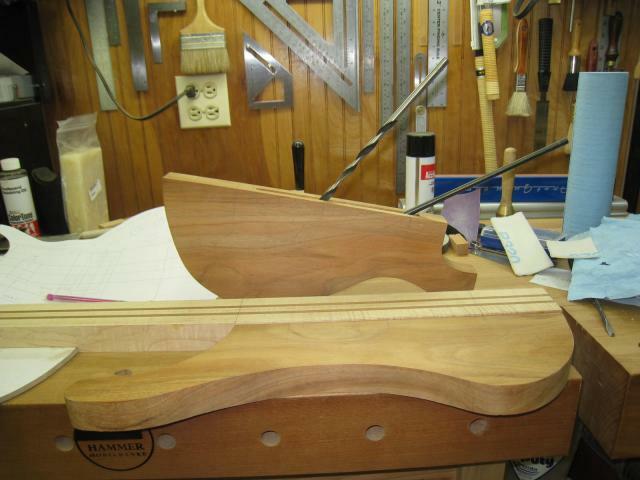 The maple binding will be pressed in between the halves and allowed to dry before glue up. A close up of the cut. 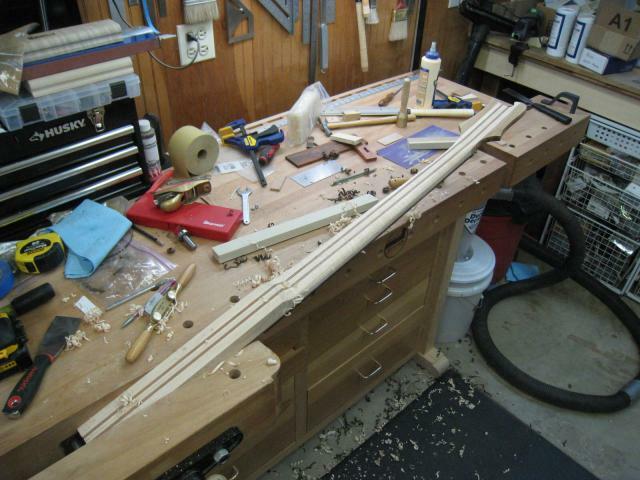 The binding will be in two pieces with each piece being bent to dry separately. 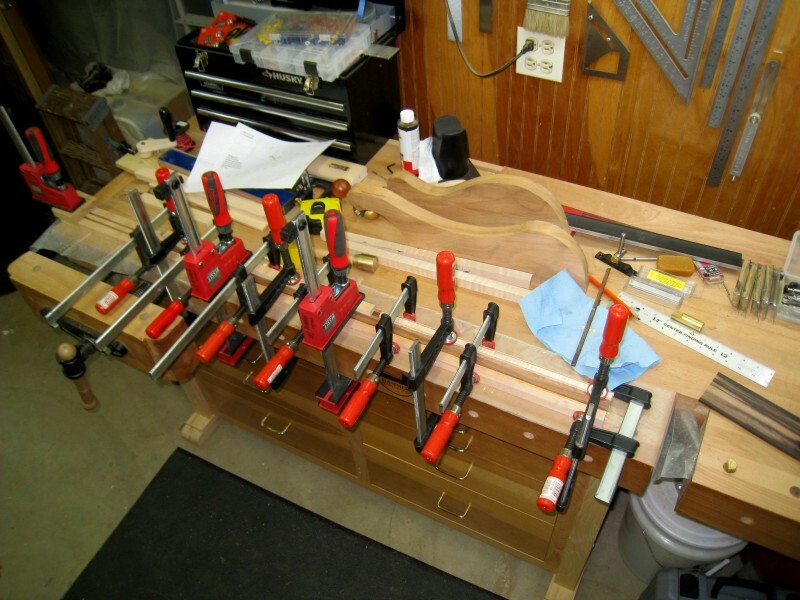 The holes are for clamps. 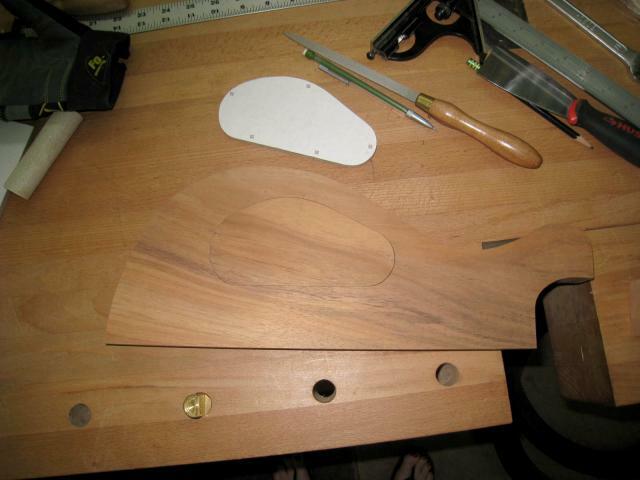 The test piece was steamed until pliable, making sure the section going around the horn was VERY well steamed. After sitting in the mould for 24 hours, the piece is removed. 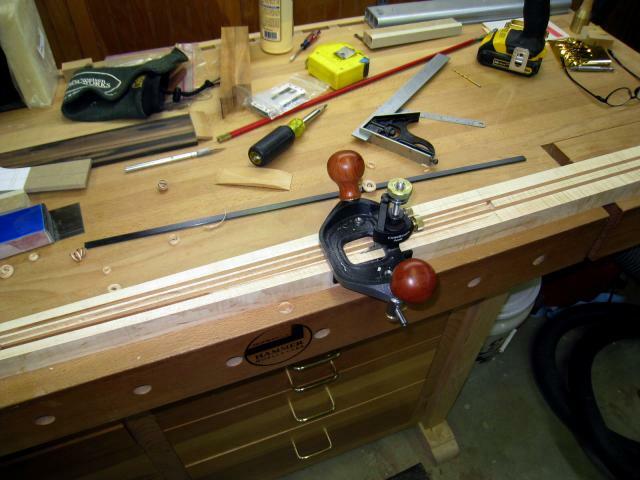 Additional bending will be required because you want it overbent so it closes tight on the body. That way the wood won't be trying to pull away in years to come. A close-up of the tight bend around the horn. There was only one sign of broken fibers. I forgot to include a photo of the binding in the form. This is what I'll be using to fine tune the bends. 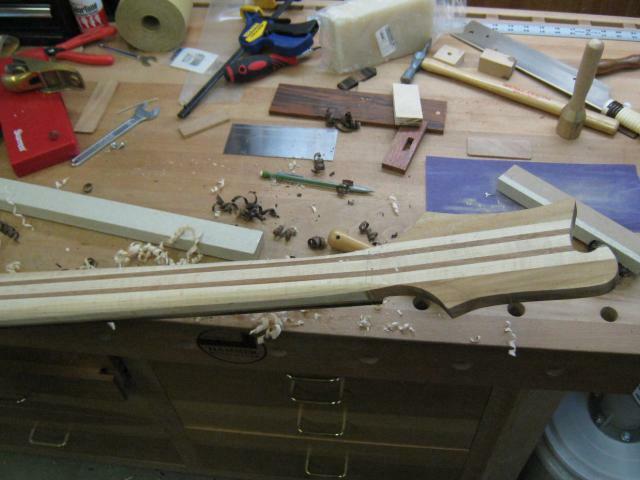 A shot of the (almost) finished neck from the top. And a shot from the back. 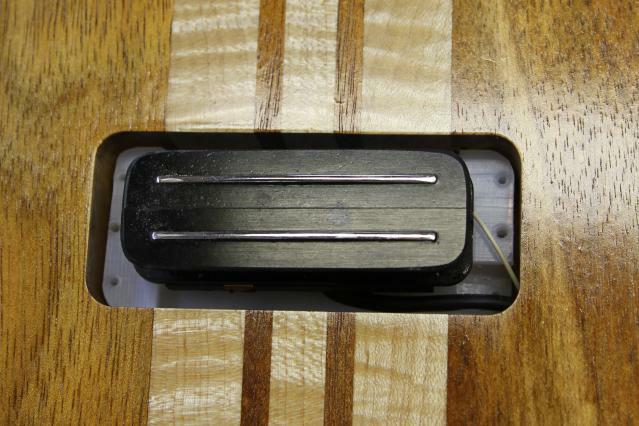 Bridge pickup with a base I fashioned out of HDMW. 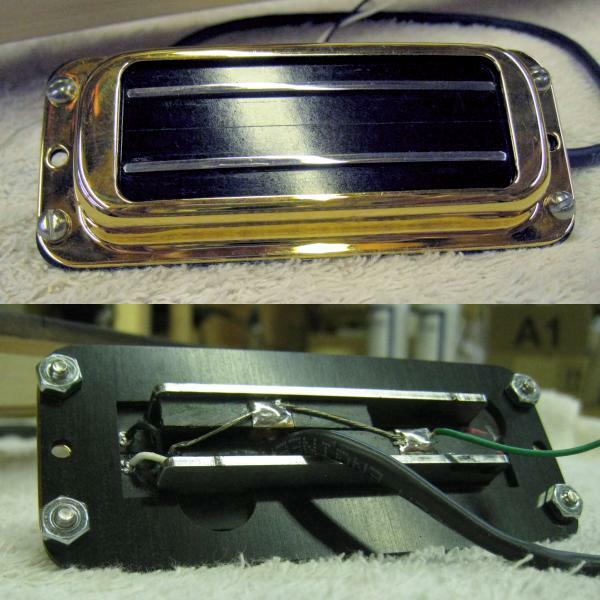 This is the front and back of the neck pickup, mounted in a separately purchased pickup cover. This is what I have to work with right now. 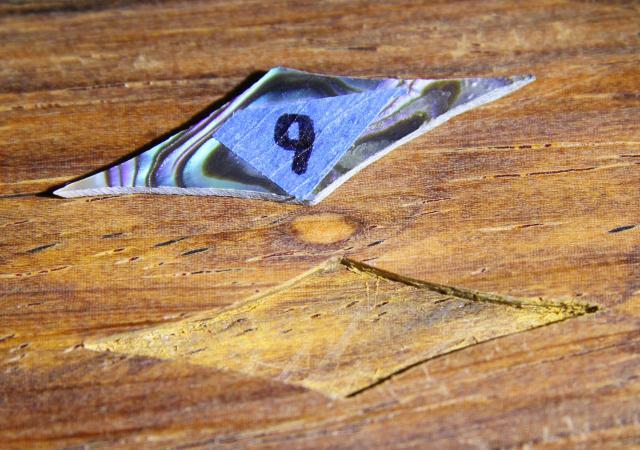 Above the neck is Mother of Pearl, below is a laminate sheet of purple Abalone shell. 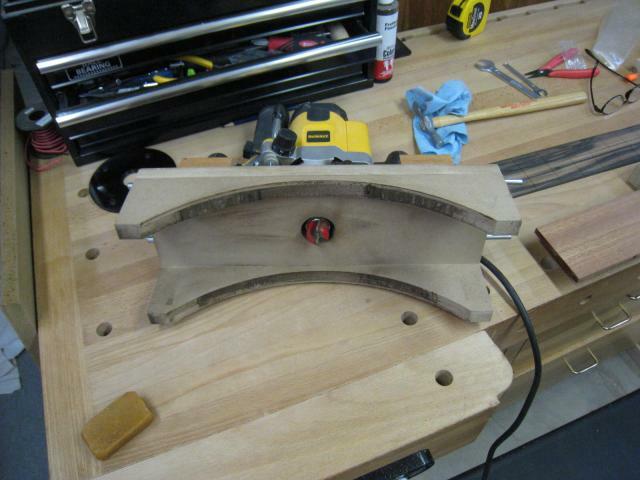 I made a cover out of maple to see what shape would look best for the bridge pickup. 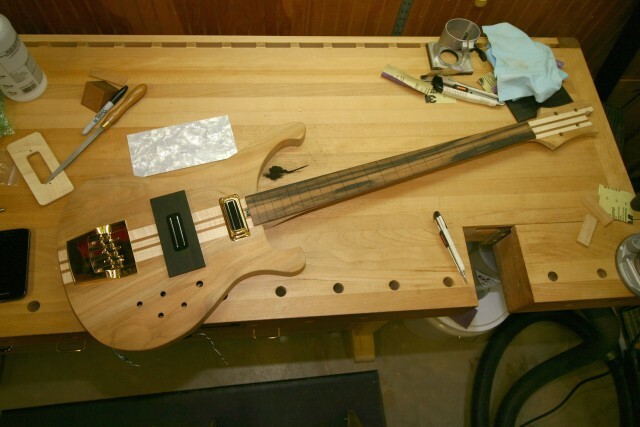 Ric basses are known for having huge bases for attaching the bridge pickup to. So I started large. I routed out for the two pickups. 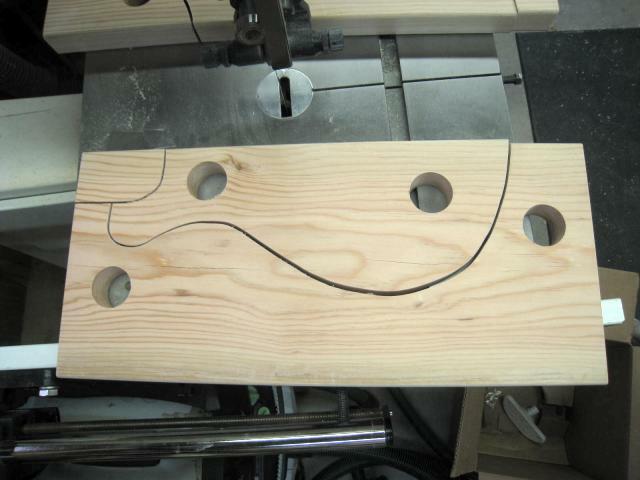 The holes I drilled earlier (shown in the photos above) ended up nicely inside the pockets as I routed to the necessary depth. 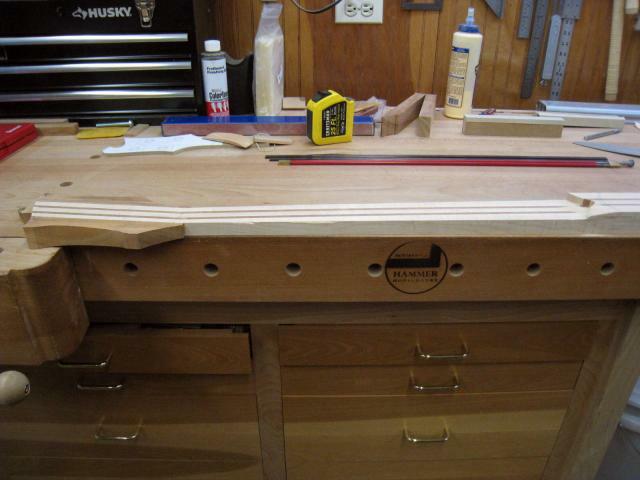 The neck pocket is 3/4" and the bridge pocket is 1-1/16". 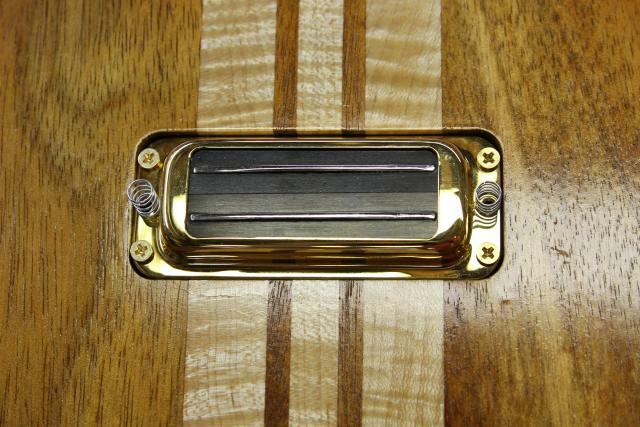 The way the bridge pickup is made requires a deeper pocket depth. The pickups fit snugly in the pockets. And the wires fished through the holes with no problems. 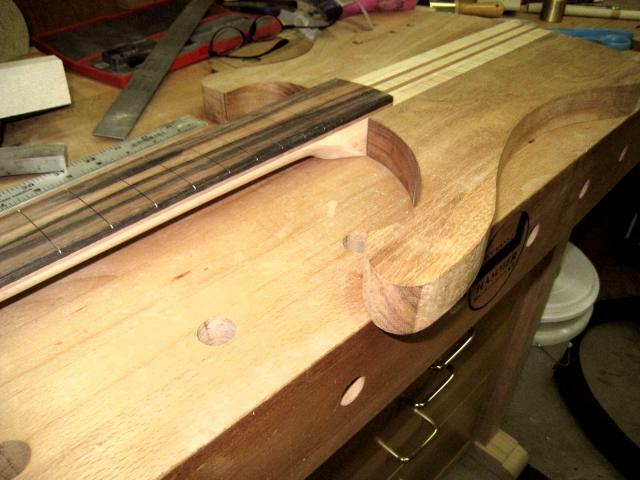 Now comes the decision on how to set the pickups. I want as much of the Koa and Maple to show as possible while still trying to preserve some of the Ric look. 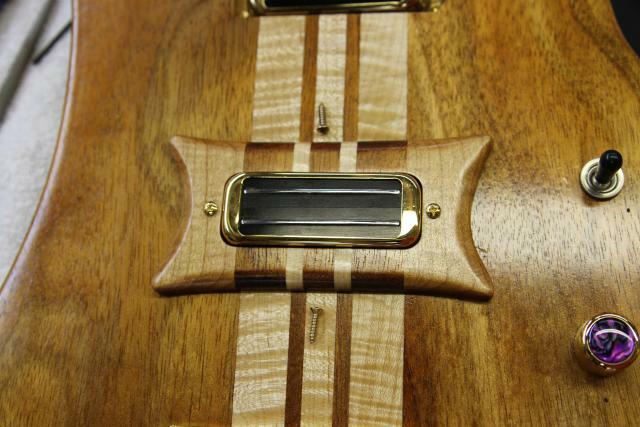 In the picture above, the wood surrounding the bridge pickup is curly maple. The figure will show much better when it's finished. 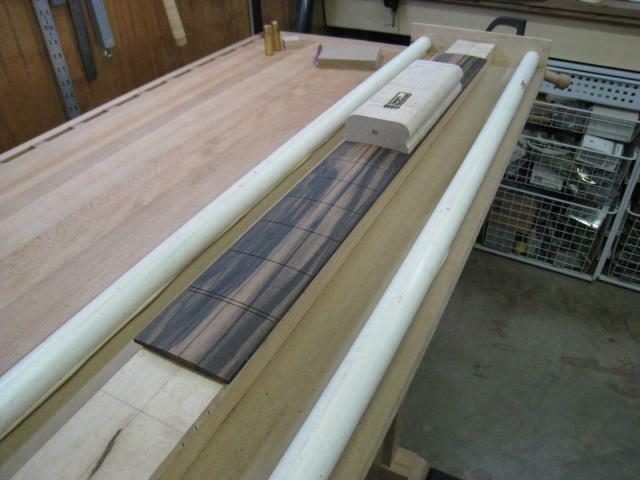 Next was seeing how Gaboon Ebony might look. 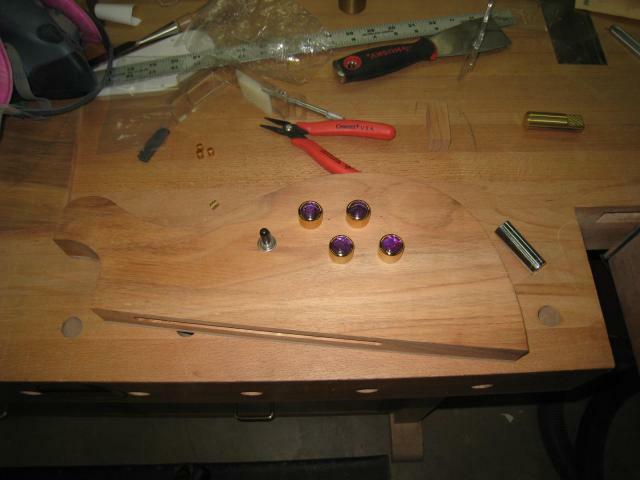 The final shape is yet undetermined so I left it rectangular until I come up with something that compliments the bass. 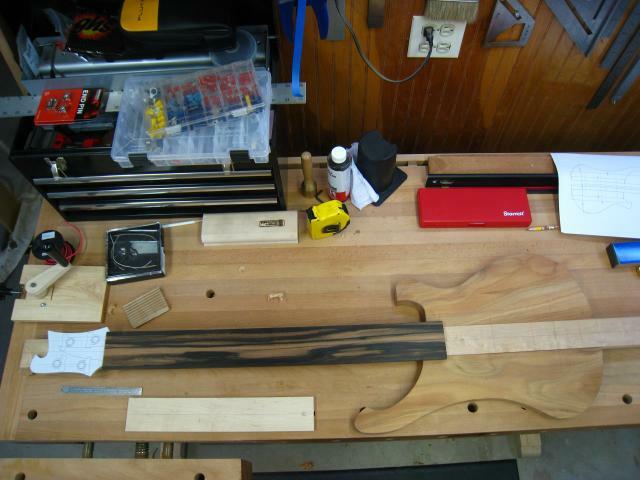 The Koa will be much darker so the Ebony might work. 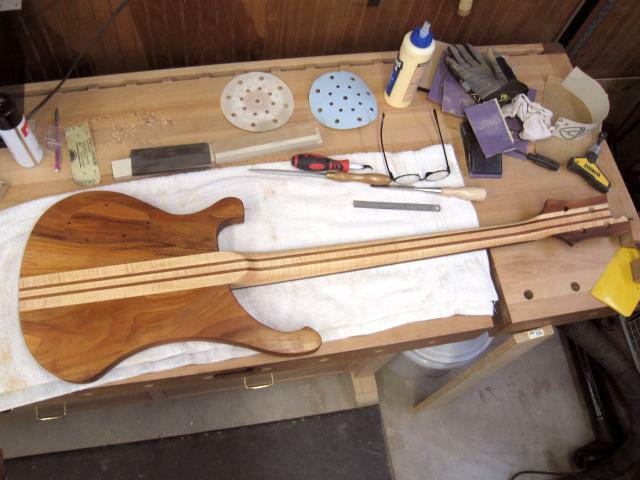 First coat of Tru-Oil. The tone didn't come out to accurately reflect the actual colors (my bad - new camera) but the pic on the left is closest. 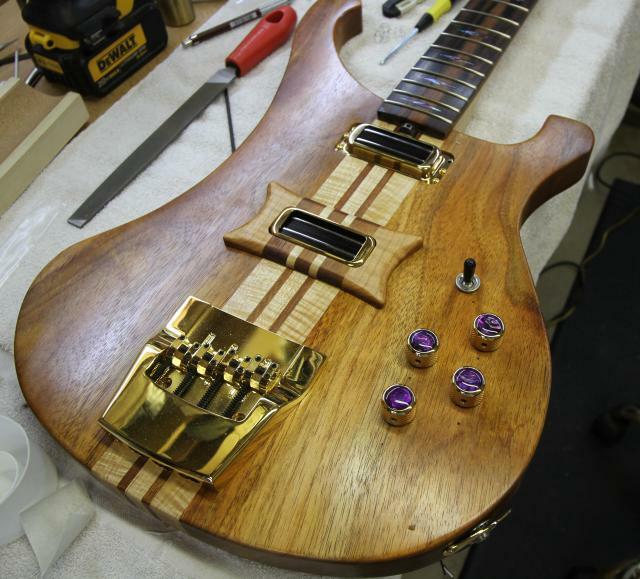 I'll add a few more coats while waiting for the fretboard inlays to arrive. The new owner had a tough time picking them out. 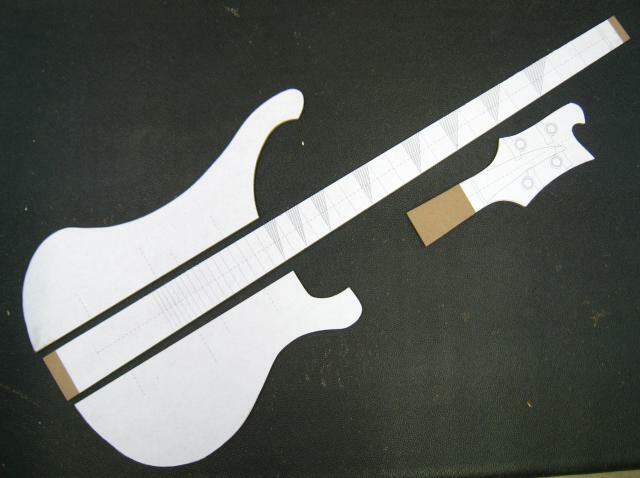 Preparing to design a cover for the bridge pickup. 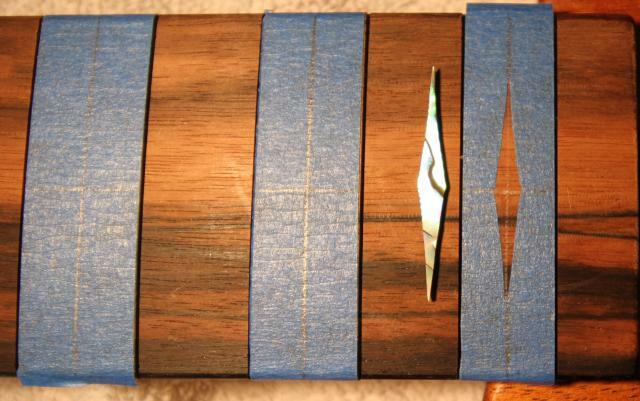 On the bottom is a piece of Gabon Ebony that has been routed out to accept the gold pickup cover. 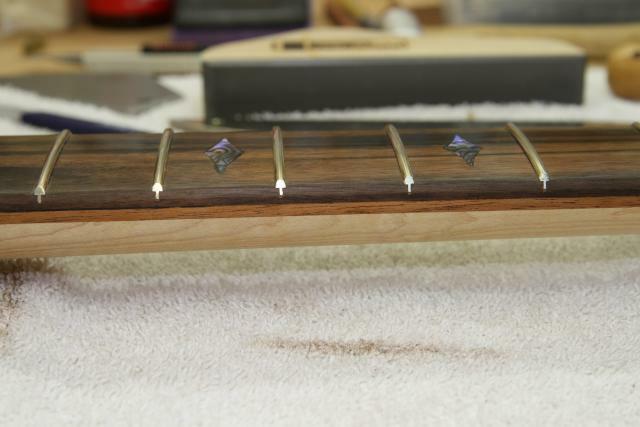 The blue/purple abalone ready to mark up on the fretboard. 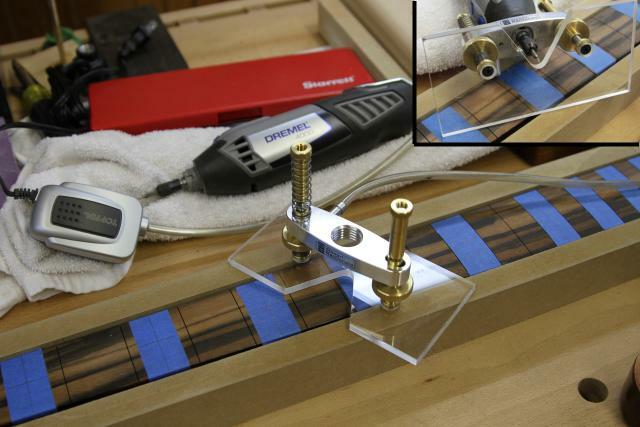 I places painter's tape over the area where the inlay goes and scribed it with a X-Acto knife. Much easier to see and more accurate than pencil marks. This is the operating room. 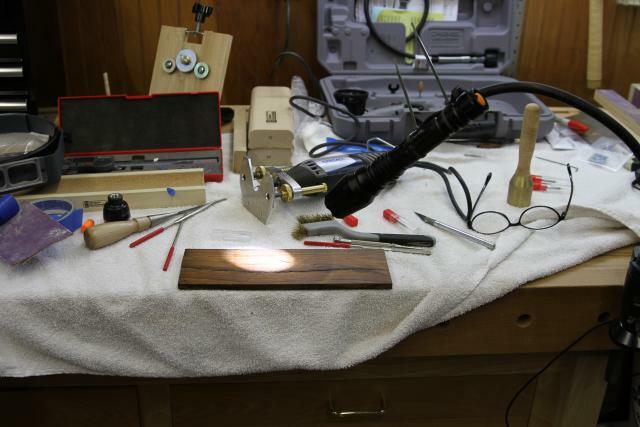 I started with a piece of Cocobolo to practice on. 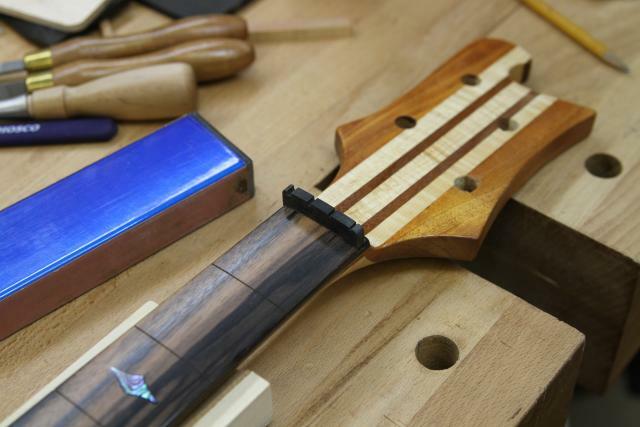 It has colors close to the Macassar Ebony on the fretboard. In order to get enough light, I ty-wrapped a high intensity LED to it. Magnification inclused the glasses on the right and a jeweler's magnifier with 2.75x on the far left. The sharp outside points were too fine for a 1/32" bit to get into. I had to use a 1/8" chisel to snug up to the point and then an X-Acto knife to finish them. For reference, this piece is 0.4" tall and 1.3" wide. It's one of the easier pieces. The number represents which fret it will sit above on the fretboard. 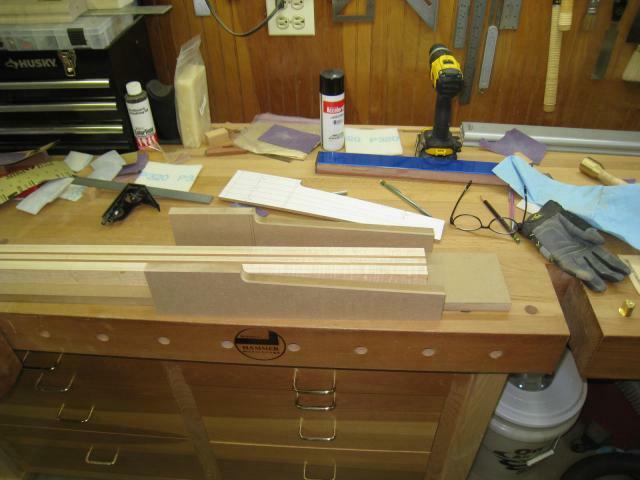 I milled (2) pieces of 3/4" MDF for the side rails, to keep the onlay rout flat on the bottom and then made a new, wider, base out of 1/4" Plexiglas to span the rails. The black and silver box on the left is an aquarium air pump. It connects to the base and is supposed to blow away the dust as you cut. This 5-gallon rated pump didn't work so well. Back to the store! I got the Stew Mac pump but it didn't make much difference in cleaning out the dust. So I ended up removing the hose from the base attachment and ty-wrapped it so it blows directly into the area I'm working on (see above). That worked. 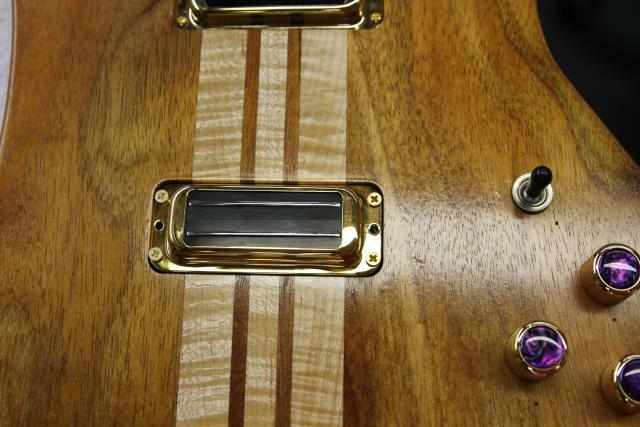 The bulk on the wood has been removed for the inlays. 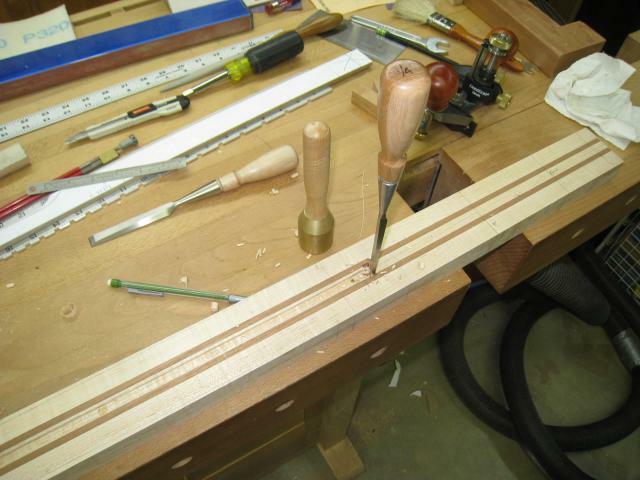 The outer points are very sharp and too small for even the smallest router bit. They will have to be cut by hand. I purchased a Micro Fence plunge base for the Dremel and it made all the difference in the world! 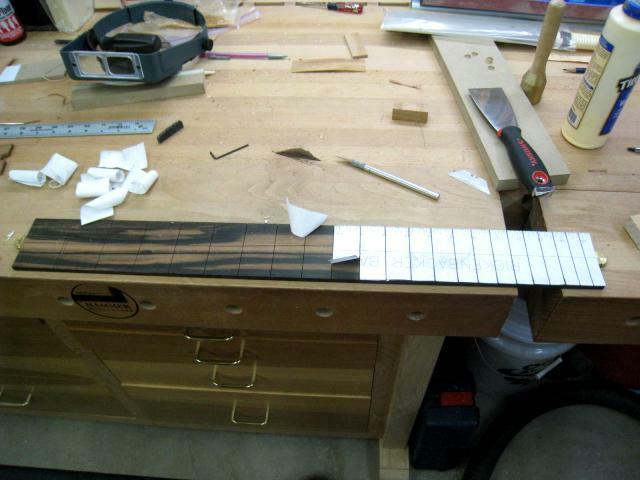 The inlays for frets 3-12 are now glued in. 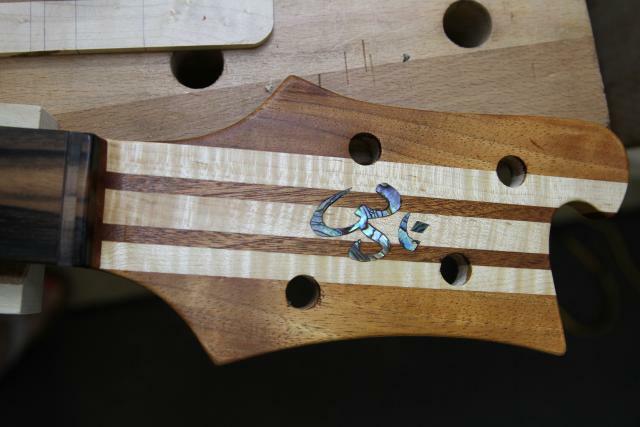 With all the inlays glued in place, the next step was to fill in the gaps. 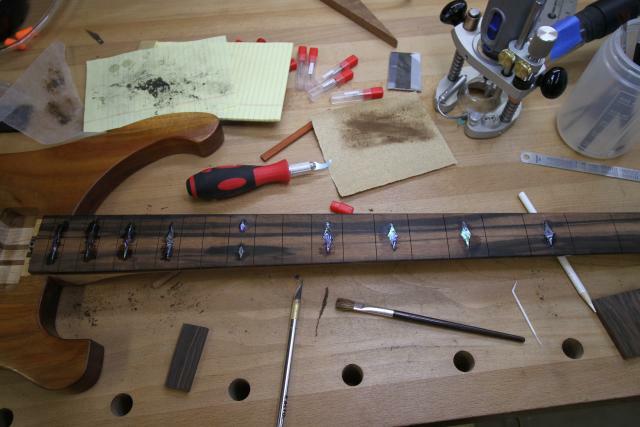 I created some sawdust from a piece of Macassar ebony and a piece of Gaboon ebony, the latter so I could have some very black dust to match the black grain on the fretboard. Once packed in place, I dripped in some CA glue - AKA: Superglue. 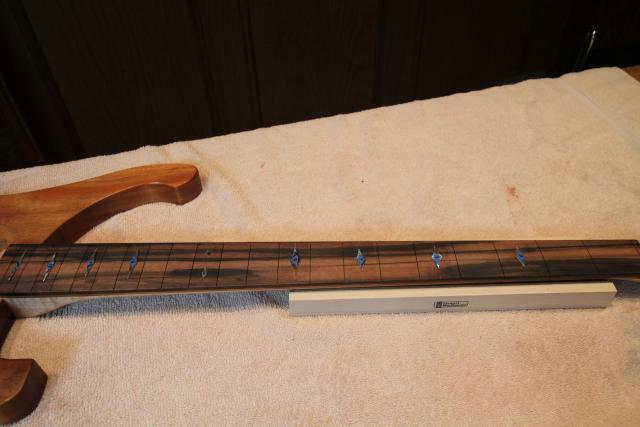 The fretboard has been polished to 12000 grit with Micro Mesh. 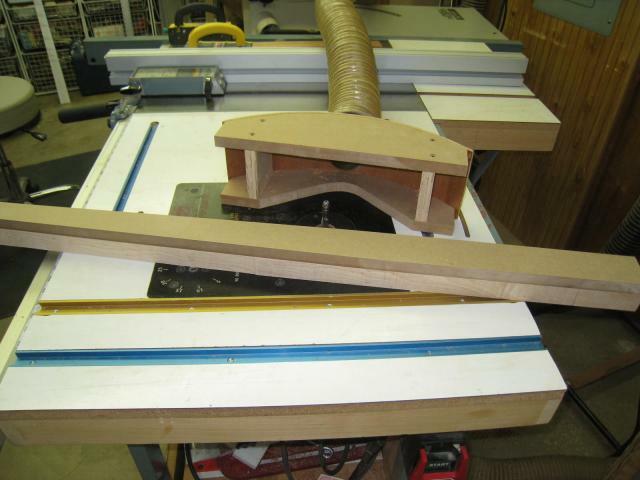 The process was 120, 240, 320, 400 with standard sandpaper. Then 1800, 2400, 3000, 3600, 4000, 6000, 8000 & 12000 with Micro Mesh. 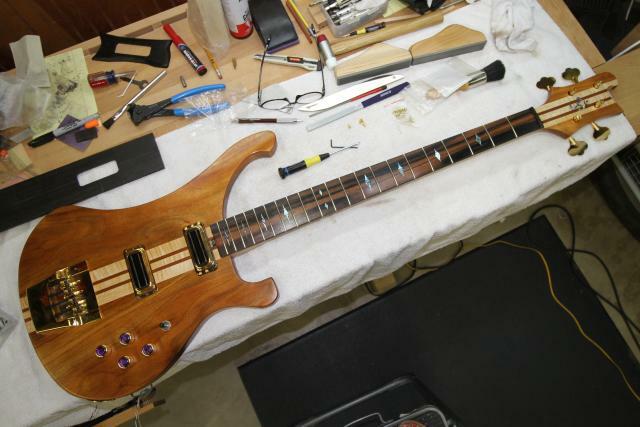 This nut was purchased through the Rickenbacker website. It's 3/8" thick and seems to be made out of some sort of phenolic material. 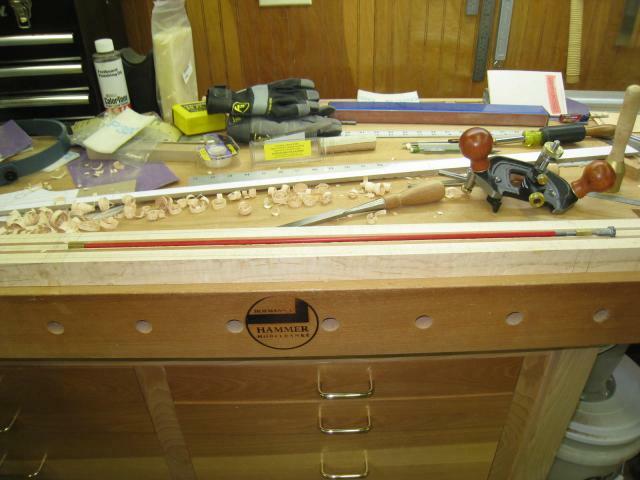 In the world of guitars, there is bone, ivory, plastic and Tusq, a very friendly and easy to work with nut material. 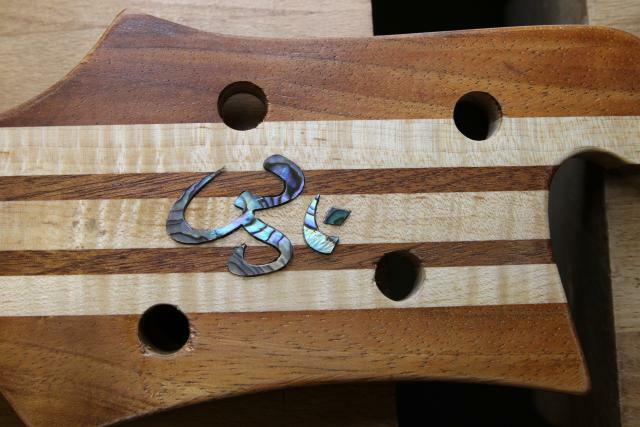 After a lot of fine tuning, some with an X-Acto knife, the abalone inlay fit snugly. 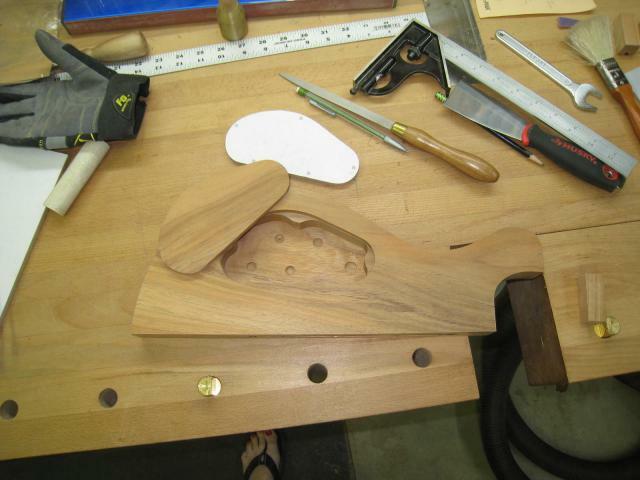 After some sanding, the OM is one with the headstock. 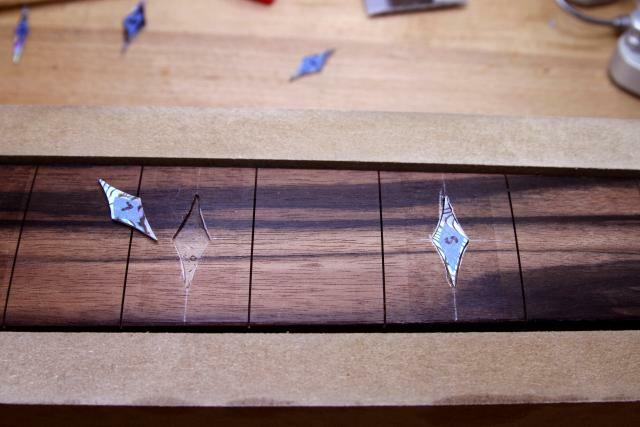 Because I cut the fret slots by hand, I was able to set the depth to match the tangs. 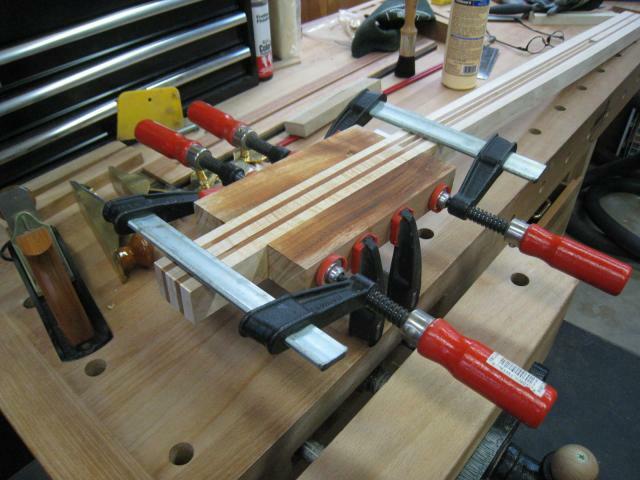 No gaps to fill under the bottom of the tang. With everything in place, it's time to assess where we are. 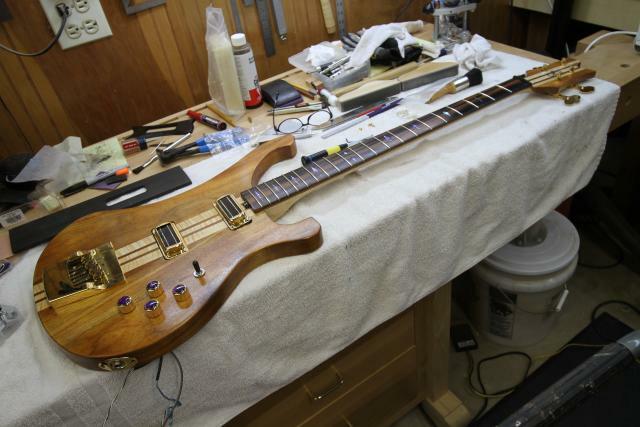 My only dilemma now is how do I deal with mounting the pickups? 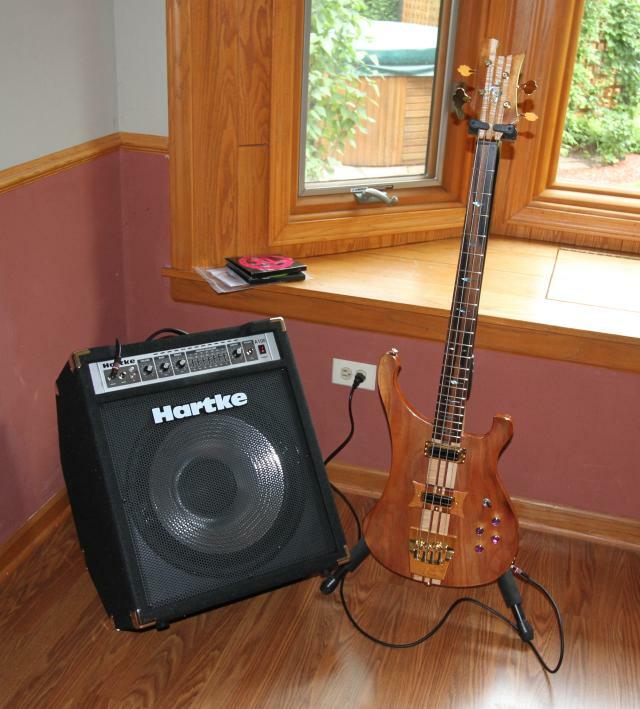 If you are familar with Ric basses, you know what I mean. 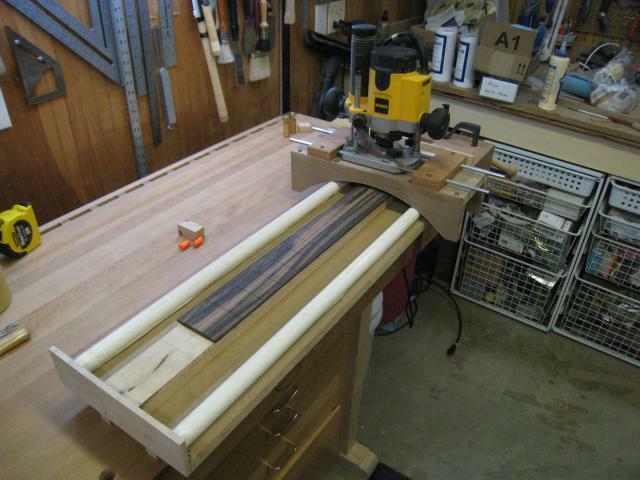 I used maple and Koa to make a surround for the bredge pickup. 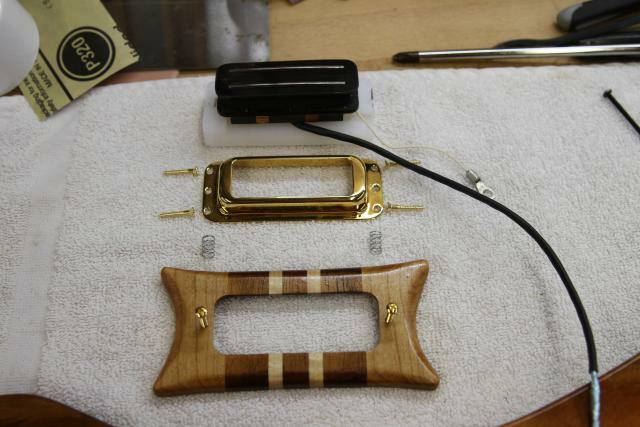 I needed that because the bridge pickup needs to be raised up higher than the neck pickup to a point it would expose the underside of the brass ring. 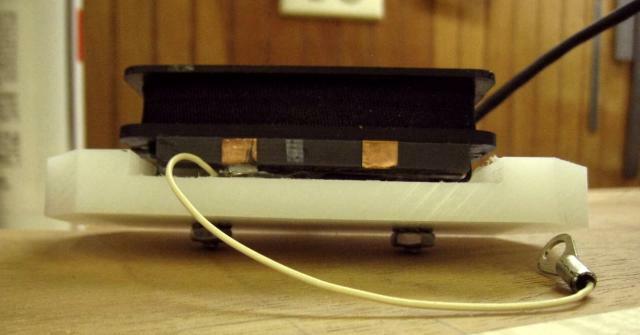 In the above picture, the pickup is mounted to a shop-made base made out of HDMW. 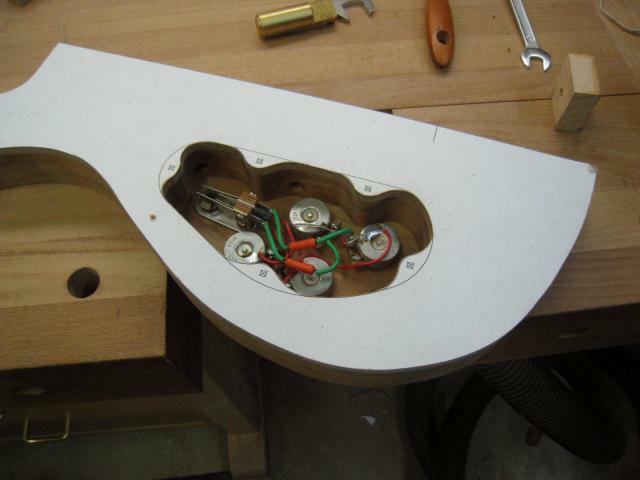 Below that is the pickup ring with the (4) screws that will secure the ring to the base. 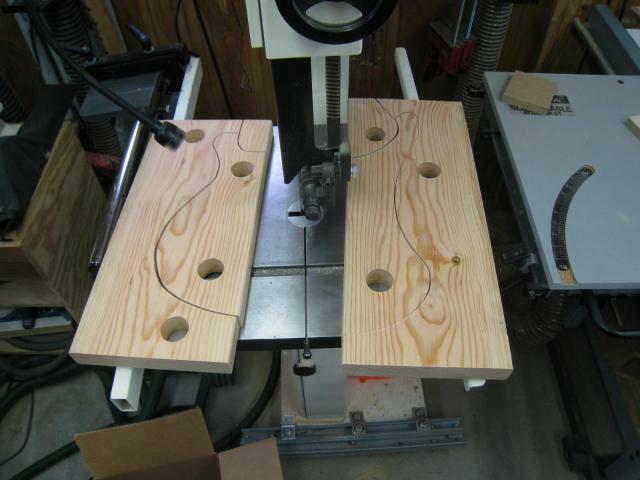 Next are the springs that will be placed on the top of the ring and held in place by the (2) screws in the Maple/Koa surround. 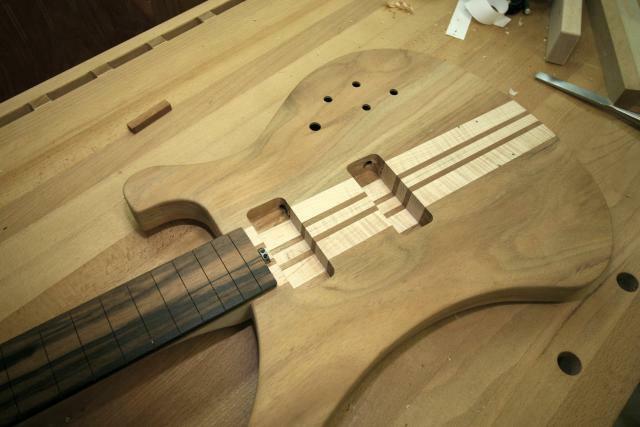 The pickup and base are set in the pocket. 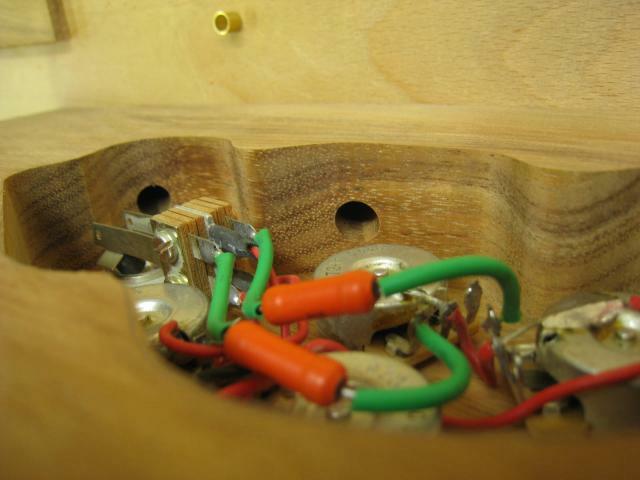 There is a notch in the bottom of the base that will accommodate the pickup wire as it enters the channel to the control section. The notch is on the right, just above the black wire. And the cover screwed into the base. 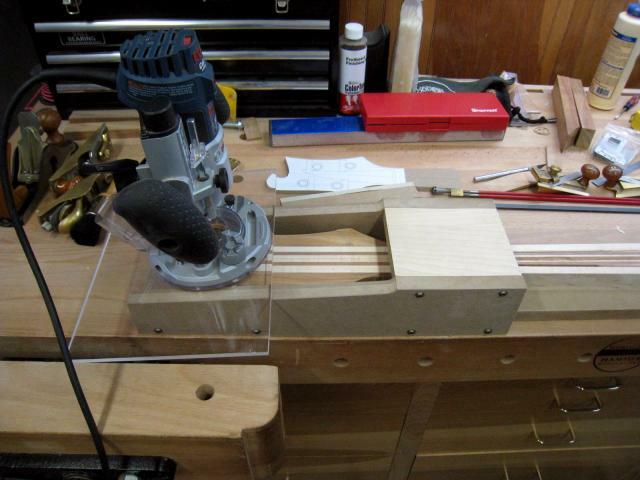 All that's left is drilling (2) holes for the screws that will secure the cover to the bass body. For now, it's playing. After we get set up in the new digs, I'll finish the lacquer and do the final setup.